Automatic teller machines not only dispense money, ATM-like machines also vend other products such as chocolates and soft drinks. But Amul has gone a step further: it will now sell milk through “Any Time Milk” vending machines. The pilot project of this 24x7 ATM began with the installation of a vending machine at the gate of Amul Dairy in Anand town of Gujarat on Sunday. 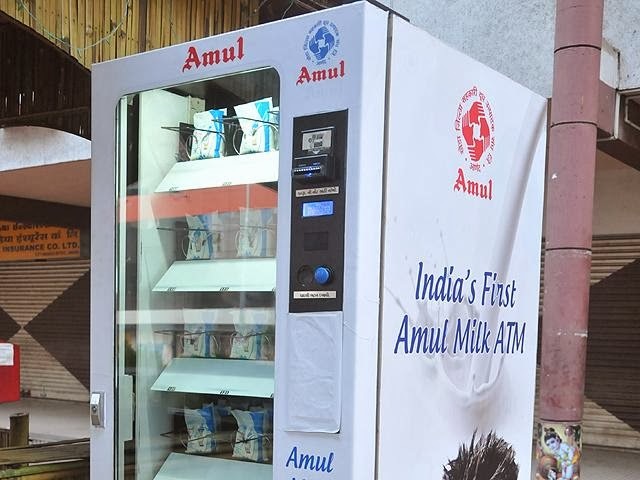 “To start with, we plan to set up these ATMs at each of the 1,100 ‘mandalis’ (village-level milk collection centres) in Kheda and Anand districts where we market Amul, Ramsinh Parmar, Chairman, Kheda District Milk Producers’ Union, popularly known as Amul Dairy, told Business Line on Tuesday. In Anand and Kheda towns, these ATMs will be installed at different public places to enable the consumers to buy milk whenever needed. He said Amul Dairy is in talks with the Kheda District Cooperative Bank to work out financial aspects of the project. For a Rs 10-currency note, which this machine will read through a sensor, the ATM would dispense a 300 ml pouch of Amul Taaza milk. The ATM, fitted with refrigeration facility, has a capacity to hold 150 pouches at a time. While Kheda Union, which owns the Amul brand, markets milk in Anand and Kheda district, it is marketed by the Gujarat Cooperative Milk Marketing Federation (GCMMF) elsewhere. GCMMF is also likely to follow suit after a review of the project.